Movies have been telling stories about dogs in the military since Rin Tin Tin starred in silent films like “A Dog of the Regiment” way back in the 1920s. Those were made-up stories that turned “Rinny” into one of Hollywood’s biggest money-makers of the pre-sound era (supposedly even getting him the most votes for Best Actor at the first Academy Awards in 1929). 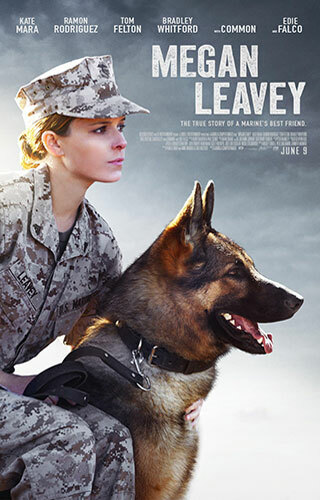 More recently we’ve had “Always Faithful” and “Max” and now we have Megan Leavey, the true story of a female corporal in the Marines and her dog Rex, who both served in Iraq. Directed by documentarian Gabriela Cowperthwaite (“Blackfish”) the movie confines itself to the facts of Megan’s story and smartly doesn’t tackle any social or political issues like women in the military and the reasons for going to war with Iraq. It starts as Megan is a teenager living in a small town in New York, lost and depressed after graduating from high school. She has a dead-end job and lives with her divorced, alcoholic and sleep-around mom (Edie Falco, “The Comedian”). Searching for meaning in her life she spontaneously enlists in the Marine Corps and winds up in the K-9 corps led by Gunny Martin (Common, “John Wick: Chapter 2”) working with dogs trained to sniff out improvised explosive devices (IED) and land mines. Cowperthwaite takes us quickly through the enlistment, training (watch for the real Megan Leavey herself as a stand-in extra during the dog-training scenes) and deployment to Iraq, sticking strictly to Megan’s subjective point-of-view. From there we’re on to the front-line of the war as Megan and Rex lead soldiers into battle searching out any hidden bombs and traps that lay ahead. They are so successful and expert at their jobs they earn the respect and admiration of their fellow soldiers (including Tom Felton, “A United Kingdom”), who clearly recognize that Megan and Rex are saving many from injuries and death. But when the fighting starts, Cowperthwaite stages the battle expertly, with all the panic, confusion, fear, and bravery of war. She shows feature-film chops here with Megan Leavey, skills that go beyond the documentary genre. Kate Mara (“Fantastic Four”), as Megan, in her first major leading role that I know of (she’s soon to play Mary Jo Kopechne in the Ted Kennedy bio-pic “Chappaquiddick”) brings us along from the sad-sack teenager to her bonding with Rex and eventual achievement of war hero, with a sense of honesty and reality that holds us for the entire film. Watch her eyes as she hugs Rex after he is injured, and you’ll see a whole life in her expression. It all works toward an intense and heartfelt story, so when Megan finally retires from the military and wants to adopt Rex, and the bureaucrats say she can’t because military dogs are “warriors not pets,” we can’t believe for a second the two can be separated. Megan becomes authoritative and commanding in her quest, leading to an ending that had many reaching for Kleenex in the screening I attended.